Soda drinks side effects are a reality! Most of us carry this misconception that diet soft drinks help in our dietary regimen. If you, too, think on same lines, think again. With the additives and chemicals infused in diet soft drinks, we must now start thinking about diet soft drink side effects. According to a Boston University research report, Coca Cola and Pespi had paid millions of dollars of "dirty money" to 96 US health groups to downplay the role of their products in increasing the obesity epidemic. This reminds similar attempts by the sugar industry in the 1960s to influence research reports that put the blame on saturated fat, ignoring the role of sugar in causing heart ailments. Like you, once even I was under the misconception that my favorite diet soft drinks are helping my dietary regimen. After having read so much about diet soft drink side effects, I was just wondering that these fizzy sips were so close to my heart a few minutes back. Yes, it is true diet soft drinks also have side effects, and if you are wondering what are they, then you would be taken aback when you come to know that you do not lose weight sipping diet soft drinks; rather, you are at a higher risk of gaining weight after drinking them. Several studies have revealed that those drinking diet soft drinks are at a higher risk of gaining weight. A University of North Carolina study shows that if we reduce the intake of diet soft drinks, we can cut approximately 450 calories a day. Unbelievable, is it? Another study conducted by University of Texas shows that each bottle of diet soft drinks comes with the risk of overweight and increases chances of weight gain by 41 percent. Now you must be wondering how a zero-calorie drink increase risk of obesity. When you know diet soft drinks contain no calories, you end up taking more foods, thinking that you can take some through eating, as your zero-calorie drinks would compensate for that. And this is a fact that the sweet taste of any diet increases our cravings for sugary foods. Though diet soft drinks are not sugary, they do have a sweet taste, which is enough to incite cravings for high-calorie foods. Ironically, this up-regulation of hunger stimulated by diet soft drink means we end up consuming more calories. If you are just taken aback by the weight gain theory of diet soft drinks, you still have many reasons to wonder about other side effects associated with diet soft drinks. Another study conducted in 2009 found that there was a 30% drop in the level of kidney function of participants who drank more than two bottles of diet drinks daily. This probably meant that such drinks affect the blood filtering ability of kidneys. Decline in the level of kidney function is not a minor issue. It relates to your entire body functioning. Malfunctioning kidneys can turn fatal. Though it is still unclear why diet drinks would harm the kidneys, it is something related to the sweeteners that are used in diet drinks. A few opine that sweeteners have a tendency to scar kidney tissue over a period of time, though research is still under way. All of us know and often complain that sugar in non-diet soft drinks is hard on tooth enamel and can lead to cavities. 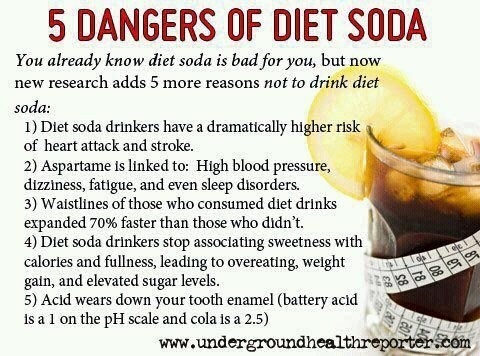 But do you know your favorite diet soft drinks also put you at a higher risk of dental problems? Diet soft drinks are known to be more acidic than their sugary counterparts. Acid content, primarily phosphoric acid, in diet soft drinks can soften your teeth and erode tooth enamel. Another acid that makes your favorite carbonated drinks acidic is citric acid, which is also known to erode tooth enamel and intensify tooth decay. Because of their acidic constituents, diet soft drinks also negatively impact bones. Phosphoric acid results in excessive excretion of calcium through urine. The loss of excessive calcium results in the bones contributing some of their calcium content to keep the calcium level in bloodstream constant. This whole process contributes to weaker bones. A study conducted in 1994 by Harvard students found that young girls who were regular drinkers of soda drinks were five times at a higher risk of getting broken bones. This only confirms the calcium-inhibiting properties of phosphoric acid in younger people, whose bones are still in the development stage. High phosphate diets, which are low in calcium, pose a high risk of osteoporosis. Children who consume soft drinks regularly face a great risk of chronic nutritional imbalance. A recent study conducted by microbiologists at Hollins University, published in International Journal of Food Microbiology, reveals that 11% of soda fountains contain E. Coli and 48% contain coliform bacteria grown in feces. That means by drinking soda drinks, you are exposing yourself to the sickening bacteria. Can you afford to do that? Drinking soda regularly exposes you to intestinal disorders. Reserachers at Hollins University also revealed that beverages and soda fountain machines contain E. coli, suggesting that more pathogenic strains of bacteria could thrive in soda fountain drinks. Some of the artificial sweeteners used to sweeten your favorite diet soft drinks are believed to be unsafe and unhealthy. For example, saccharin is believed to result in bladder cancers, which was proved during studies conducted in the early 1970s. Another sweetener in the form of aspartame is linked to lymphoma, brain cancer, breast cancer, and leukemia. A 2007 study conducted in Bologna, Italy, at the Cesare Maltoni Cancer Research Center claimed this, though it remains controversial. Other sweeteners and preservatives added to diet drinks, such as sodium benzoate and potassium benzoate, have been linked to cancer and even Parkinson's. Remember, refined sugar is the most unhealthiest substance in the food industry, and the soft drink industry uses it more than others. From obesity to diabetes to high blood pressure and cardiovascular problems, refined sugar is the main culprit in majority of the health problems concerning us today. It is therefore important to cut down on your consumption of sugar in all its forms to take a step toward living a healthier life. If you still have any doubt about the side effects of diet soft drinks, you can reduce their intake until more profound research theories validate the aforementioned ones. After all, prevention is better than cure!